Governor Jerry Brown signed a bill Friday that bans hunters from using lead ammunition across the state. The law, the first of its kind in the country, was spearheaded in large part to protect the threatened California condor. Scientists say their recovery is being hampered by lead poisoning, because the scavengers ingest lead bullet fragments in carcasses or gut piles left behind by hunters. Gun and hunting groups were strongly opposed to the bill, AB 711, saying that copper bullets and other lead-alternatives are often twice as expensive. “This is a way to bring a cultural attack on hunting and sportsmen and women,” said National Rifle Association attorney Chuck Michel, in June. In her lab at the University of California-Santa Cruz, Finkelstein holds up a vial with a small shard of metal: a lead bullet fragment found in the digestive system of a dead condor. “This is enough lead to poison and potentially kill a condor,” she says. As scavengers, condors will feed on any dead animal, including carcasses or partial carcasses left by hunters or ranchers. “They’ll come to eat it and they inadvertently will also ingest these fragments,” Finkelstein says. Through tests on hundreds of condor blood samples and feathers, Finkelstein’s lab has worked to trace the source of lead. In the majority of cases, she says it matches the chemical profile of lead bullets. In response, former Governor Arnold Schwarzenegger banned the use of lead bullets in hunting in 1997, but only in condor territory. Condors are still showing high levels of lead, which can shut down their digestive system. “It only takes one meal so that’s why the problem is so severe,” Finkelstein says. 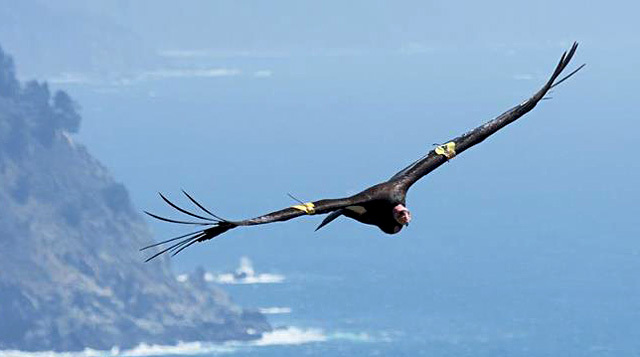 The 70 free-flying condors on California’s central coast are routinely tested for lead poisoning. Those with high lead levels are brought to the Los Angeles Zoo for chelation treatment. 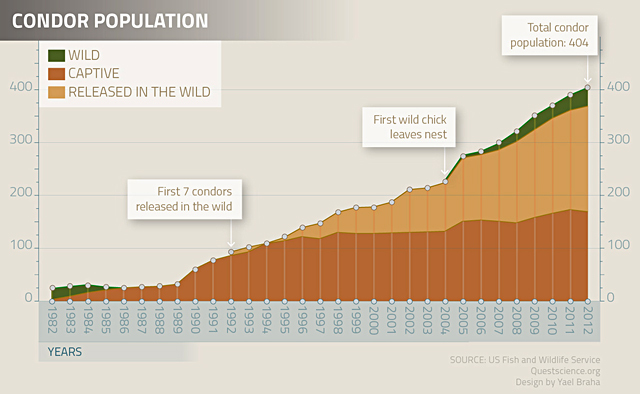 The condor population has risen from just 22 condors in 1982 with the help of an intensive captive breeding program. In a signing statement, Governor Brown said the lead bullets pose a danger to wildlife, adding, “I am concerned, however, the impression left from this bill is that hunters and sportsmen and women in California are not conservationists. I know that is not the case. Hunters and anglers are the original conservationists." Gun groups had expressed concerns that copper ammunition supplies are limited because the bullets are considered to be “armor-piercing.” Governor Brown pointed to a special provision that would suspend the lead ban in the event that other bullets are banned by the federal government. Lead bullets will still be available in stores for use in non-hunting activities, like at shooting ranges. The California Department of Fish and Wildlife has until July 1, 2015 to write the lead ammunition regulations and the ban must be fully in place by July 2019.